Ed Schrank directed the revision of the master plan of this 1,300 acre mixed use development to provide a unique identity to draw visitors to the property. The initial development is under construction around a 30-acre man-made lake. Plan B Holdings is providing on-going development management on behalf of the property. The services provided include planning, pro forma development, scheduling, estimating, and on-going procurement and construction supervision. 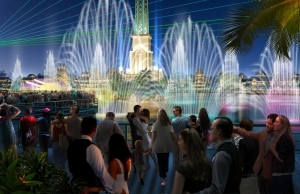 An amusement park is under construction and scheduled to open the summer of 2013 along with restaurants, retail outlets, and cable water skiing. A cutting edge golf training facility and golf course are planned to support the needs of the 5,000 future residential residents and the guests of more than 30,000 area hotel rooms.